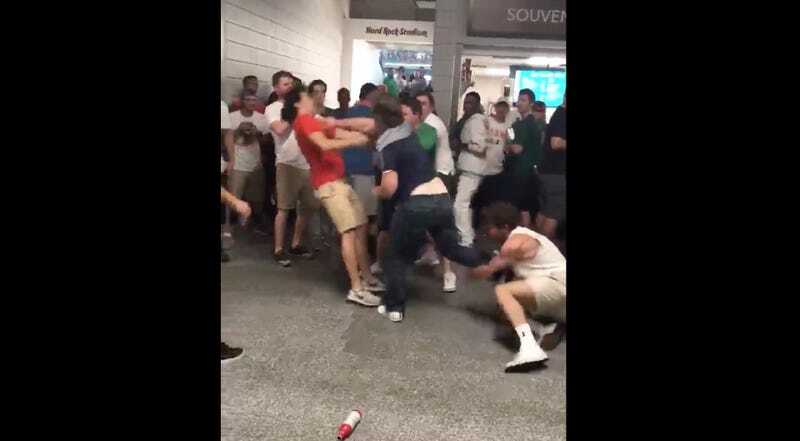 While the Notre Dame Fighting Irish were getting their asses kicked by the Miami Hurricanes on Saturday, a passel of fans reenacted the scene on the concourse of Miami’s stadium near sections 129 and 130. All was technically peaceful, until an offscreen Miami fan flung a beverage at the dude in the hat, at which point galoots traded punches. The whole thing ended after 30 or so very wild seconds. All the while, a befuddled fan in a grey shirt just sort of stood in the eye of the storm and soaked in the action. The circumstances of the fight aren’t clear, but the long-haired Miami fan seen getting in the faces of the Notre Dame duo at the start seems to be a central character, later reappearing in the fracas to catch a blow to the head and go down like a sack of potatoes. A pair of helpful Miami fans eventually disentangled the fight. According to the Miami Herald, nobody called 911 and no arrests were made.